NEW YORK (CNS) — Baby boomers and those of a similar age may recall that comedian Jay Leno used to joke about “evil twin-ism,” based on the frequent use of malignant doppelgangers in the plots of sloppily written movies and TV shows. In the top-notch but excessively bloody horror fantasy “Us” (Universal), writer-director Jordan Peele takes that trope to a whole new level. An opening sequence set in 1986 finds a little girl named Adelaide (Madison Curry) wandering away from her inattentive father at the Santa Cruz Boardwalk and entering an eerie attraction where she encounters an exact double of herself. Flash forward to the present day, and the now-grown Adelaide (Lupita Nyong’o) is disturbed, during a family vacation at the childhood home she inherited from her parents, by unsettling coincidences and presentiments. Turns out, she has cause to worry. 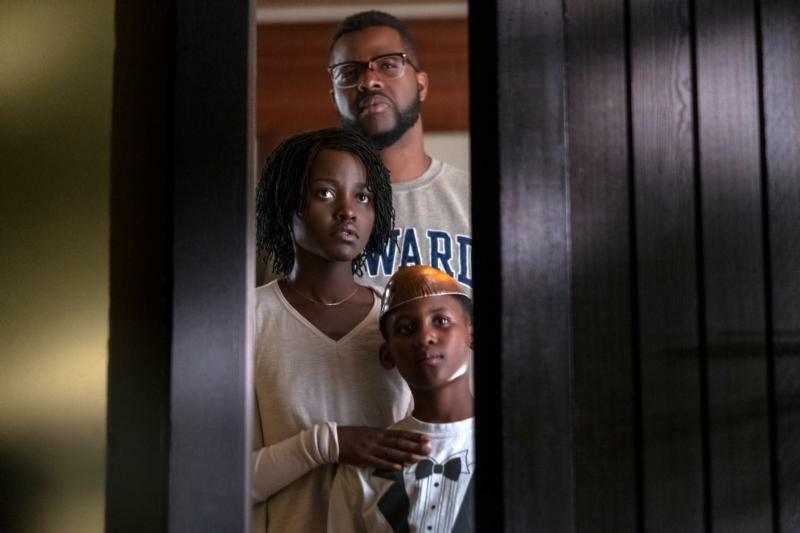 Adelaide, her husband, Gabe (Winston Duke), and her kids, Zora (Shahadi Wright Joseph) and Jason (Evan Alex), are soon visited — and terrorized — by wicked versions of themselves. The macabre replicas have emerged from the tunnels in which they dwell armed with scissors and intent on murder. There are frights aplenty in the struggle that follows as well as an allegory about economic inequality and perhaps slavery as well. However, while clan closeness proves crucial to the outcome, the mayhem unleashed on screen is too intense for a wide audience. “Us” is certainly a thinking person’s creeper. But viewers will need a strong stomach as well as an active mind to sit through it. The film contains much graphic and gory violence, about a half-dozen uses of profanity, numerous rough and crude terms and mild sexual references. The Catholic News Service classification is L — limited adult audience, films whose problematic content many adults would find troubling. The Motion Picture Association of America rating is R — restricted. Under 17 requires accompanying parent or adult guardian.